Mount Rainier is the mountain that looms in the distance over all of western Washington. It stands apart from everything around it towering at over 14,000 feet. We can’t see it every day from Seattle because of the cloudy nature of the region, which has given us the express “The mountain’s out,” to describe a clear day. Because on those sunny cloudless days, the mountain stands in the distance and the sight never gets old. 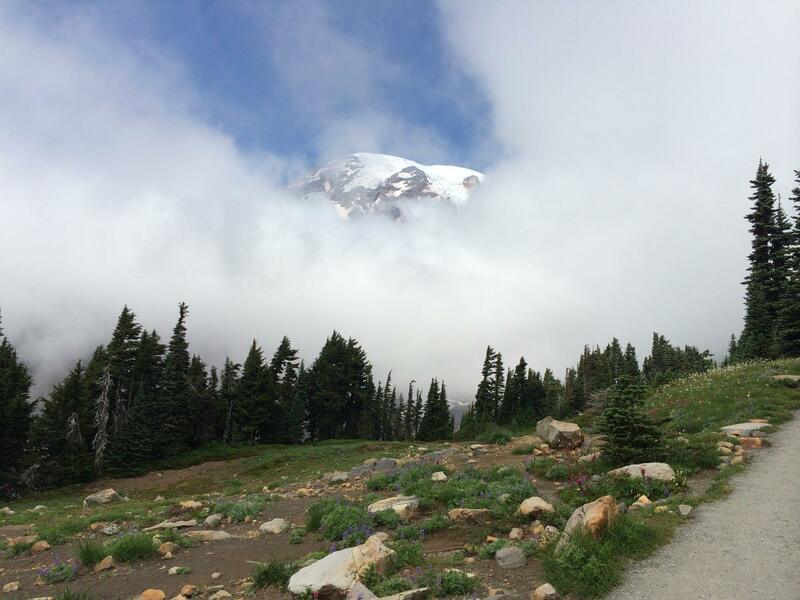 Last week Morgan and I went camping and hiking at Mount Rainier National Park. We pitched our tent at a campground on the south side of the mountain and got to hike two different trails (one each day) during our stay there. The first hike we did was through the lush forest on the southwestern side of the mountain. We were surrounded by greenery as trees surrounded us on all sides. The sunlight speckled the ground as it broke, in small bursts, through the canopy. Occasionally the trees would part to reveal a vast mountain view. The hike was breathtaking in that we were in awe of the beauty around us and also we were trying to catch our breath from the uphill and downhill climbs. It was exhausting and exhilarating. 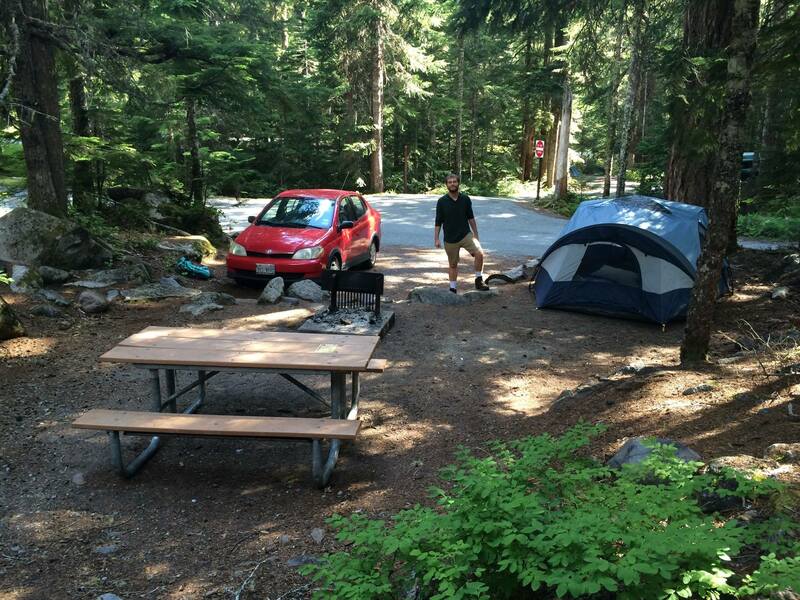 Our campsite at Mount Rainier National Park. The second hike we did was in Paradise. That’s actually what this part of the park is called. 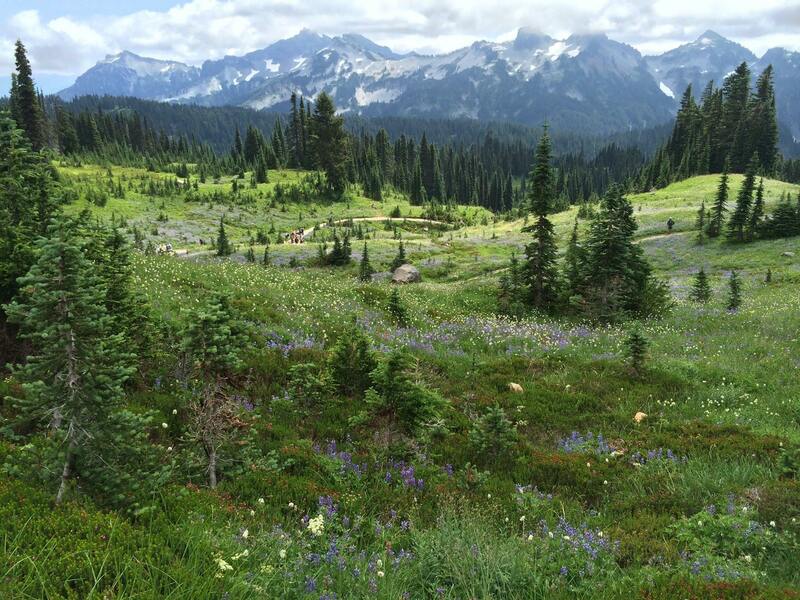 It is an area of alpine gardens filled with bright and colorful wildflowers. We were amazed at the beautiful and colorful views. Was this real? Were we really here? There’s no way this is real. But we’re really here and that is really there. Vast alpine gardens in Paradise. 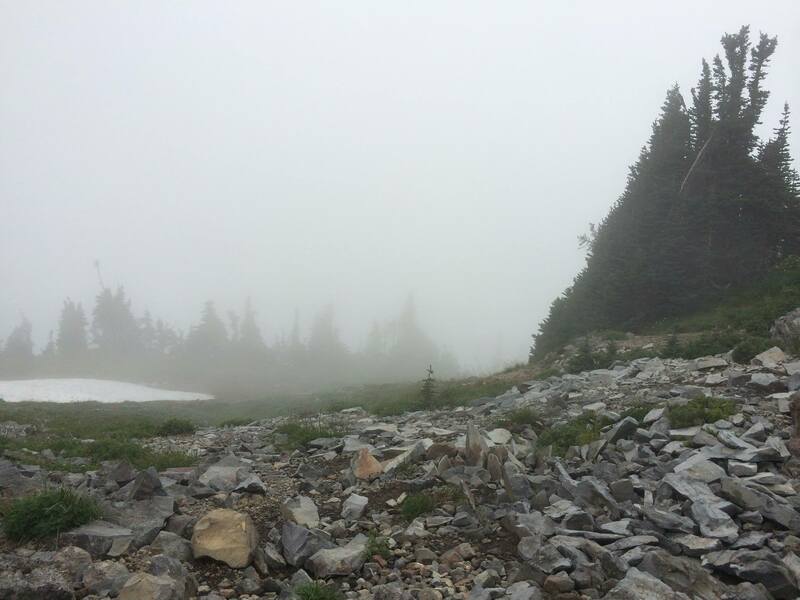 Our second day of hiking was colder and cloudier than our first and as we climbed the trail, which had an elevation gain of 1,400 feet, we walked toward the clouds. Most of the distant mountains were shrouded in their cover. We eventually climbed so high that we were surrounded by the clouds. We’re walking in the heavens, I thought to myself. I imagined the vast and expansive mountain views that were cloaked from sight behind the mountains. We knew they were there, but we couldn’t see them. And of course there is Mount Rainier—the mountain—that was inevitably looming over us, out of sight. Even distant trees seemed foggy in the clouds. Hiking the heavens inside of a cloud. Then, at a bend in the trail, we would take a turn and suddenly a break in the clouds revealed the majestic mountain standing right above us. It was there all along. O the uncontainable wonder at its great immensity! Mount Rainier as the clouds break for but a moment. In my late high school and early college years I thought I knew everything. I had life figured out and I often spoke out about it. You can trace this blog back to then and see with what confidence I wrote (except for some posts in which I wrote with far too much certainly on political ideologies). In matters of life and theology, I could cite the book/chapter/verse from the Bible to give you your answers. Everything seemed clear, colored, and certain. There weren’t any cloudy grays. The problem is that there were some passages which I must have missed. In his letters, Paul often writes about the “mystery” of faith and of godliness (Col. 1:27, 2:2, 1 Tim. 3:9, 3:16). You see, there is a certain mystery to our faith that we deny when we think we can answer all the questions. It is tempting to confine God to the clear answers made plain throughout the Scriptures, yet this limits the immensity of an infinite God. He is a God of the clouds behind which we is often hidden (Exodus 19, 40, Psalm 18, 97, Matthew 17). He is a mysterious God and life is a mysterious thing. What I have learned, and am learning, is that we live in the clouds. Things are not always clear and understandable. There are not always nice and easy answers. I used to live with a closed-fisted knowing, but I am learning how to live with an open-handed mystery. The former leads to pride, but the latter makes way for humility. This kind of living asks for faith within doubt; it learns to trust divine mystery rather than human capacity. And every now and then, the clouds do break and God reveals a bit of himself. Those moments are unspeakably and uncontainably sweet!